蓬莱人形 ～ Dolls in Psuedo Paradise. ^ (Alice’s Hourai has nothing to do with the story, but this picture of her fit the “Neither Human nor Youkai” subject’s description absolutely perfectly, so I ran with it). This is a brilliant masterpiece when you put it together. Can you find the killer? I love music, it can never fully be explained. Just like this. The first block of text is from the C62 Version and the second block of text is from the edition after that. The exception is the text-heavy track “Reincarnation” of which the part after “interlude” is still part of the C62 Version. If you haven’t listened to Hourai Dolls before, I really suggest you do. I recommend all of the tracks, “二色蓮花蝶 ～ Red and White” and “桜花之恋塚 ～ Japanese Flower” and “Circus Reverie” are some of my favorites, but “明治十七年の上海アリス” (Meiji 17 Shanghai Alice), “Reincarnation”, and 永遠の巫女 (Eternal Shrine Maiden) and a few others from the PC-98 era have very noticable changes from their first appearances, and I feel are much richer. ZUN really is a brilliant composer, though I figure most people who don’t have a flavor for that “game music from a lost age” as ZUN puts it wouldn’t recognize it until the great explosion of arrange groups take and transform the originals through different genres and even more transformations. By the way, if you have the cover (of the “press version”) that shows the culprit (of the C62 story). We – the honest village, were originally a group of just eight. We had all decided together to move into the eastern mountains and pass the time for two years. Everyday was an honest tedium. One day, one of our number found a small hole in the curve of a peach tree. Yes, it was from then on that we stumbled into paradise. Then and there, I quit being human. I, the most curious of our group, hurried ahead first and set my sights deep into the forest. There I was stopped by a mysterious clown. For whatever reason it happily held out to me the jeweled branch of Hourai. When I reached out to take it, in that very instant my head was separated from my body. I couldn’t move, and I couldn’t ever see my friends again. And then there were seven honest ones left. …But I wonder if you could find the jeweled branch of Hourai. In the morning, I saw a red and white shrine maiden dancing on the surface of a pond. The earliest riser of our group, I was fascinated by her ruthless and radical dance for quite some time. Eventually it began to rain, and when I came to my senses, the shrine maiden had vanished. It looks like another strange person’s found their way in again. The rain knew no end. A shrine maiden, her body drenched, was disappearing as if she were melting into the rain. While I was captivated by the shrine maiden, the rain became a frightful storm, and I, the most beautiful of our group, was captured by a clown. Then the clown vanished into the storm, and I was unable to return to our group. And then there were six honest ones left. I wonder if even now under that cherry tree * is sleeping. Those crimson flower petals year after year are growing lighter. There probably isn’t anything left under the ground anymore. At night, we six held an exotic party. I, the youngest of our group could not yet drink alcohol or smoke opium, so I was extremely bored. Alone I crept away from the event, but in the pitch darkness I was captured by an ominous clown. My head was easily taken. I was never again able to be bored. And then there were five honest ones left. The opium smoke hovered like a cloud, and passed into that place in the town. I live in a land concession. The people wearing colorful clothes and dancing the waltz, their magic won’t reach me here. I ran until I was out of breath. I, the most cowardly of our group, had grown afraid of this paradise. I had thought as much, but no matter how far I ran, I couldn’t find the way back. Already the one I loved had disappeared, and whether or not she was alive there was nothing I could do – at length and in despair I strung a rope over a thick branch and tied it around my neck. I, the most cowardly of our group, was reborn. Having nothing left to lose, I decided to pretend to be human just once more. But I know: If the youkai let humans think that, then they can live in peace. Youkai are far more peaceful and realistic than humans. When I woke up, the five of us were in the dark. According to one of us, we were belaid by a strange clown. The other four were constructing infantile escape plans. I, the most wise of our group, saw that it would be fine to just wait it out, but in the end, I never said it aloud. The four’s plan was carried out according to plan, and against my calculations suceeded, but I was never able to escape from the darkness. While I was killing time in endless darkness, I felt a presence right behind me, but I just let things go as they would. I felt something hot on my back. Ah, this doll, I really want to throw it away. After all, those blue eyes. Sometimes a black crow comes and takes them away in its mouth. Those eyes are real. I know, because I’m always putting in new ones. We were able to make our brilliant escape. We felt like geniuses, and went back to the place we were staying at in paradise. No one had any doubts about the other. So, up next is the bird-man! This man called “bird-man” exists only far in the south country, and even there is rare, a child born from a bird of paradise. His parents died long ago, and so was a poor lonely child. But we saved him from that! Aren’t we great? Paradise prepared us a perfect building to live in. This ancient western mansion deep in the forest has always let us stay in. It always has a great store of food, but now we do with half. Since when was our honest number halved? Since I’ve wandered into this house, I haven’t seen the sun once. I wonder how many days have passed? The doll began to talk to me. I twisted the doll’s head off. It looked as if the rain had stopped. We always have tea in the afternoon, and the bitter coffee I always have today tasted a bit sweet. I, the most mature of our group, in love with a beautiful clown, happily fell asleep. And then there were three honest ones left. Of course not. I’m not an idiot. I was just laughed at for telling my friend. That the shop over there was selling a love potion. So without telling anyone, I broke the piggy bank. I saw that one of my friends was clearly killed with poison. There’s no way it could have been suicide. I was the one who chose everyone’s coffee according to their tastes and carried it to their rooms. I didn’t tell the other two of his death. I, the most wary of out group, didn’t eat anything besides the food I prepared myself. I desperately stayed awake until the other two were sound asleep. We had gone into separate rooms and locked the doors. Yes, I suspected one of the two. Somewhere near by I heard the sound of a something being nailed into a tree. Which of them is behind this? In the darkness my face twisted in fear. Matched in time with the sounds, my hands and legs began to hurt. It felt as if 15 centimeter nails were being knocked into them. I considered whether I should consult a medium, and then I realized the obvious. Of course, I’m being nailed into a tree and can’t move. Which of them is doing it? Then I felt the final nail against my brow. Then just as I predicted I saw a face. Before I had time to yell out, the light went completely out. You were way too much of a coward. Don’t you realize that being honest only sets yourself up to meet a cruel fate? Did this escape from the world paralyze your old sharp senses? Don’t you yearn for the bustling town, for riches and happiness? I, in the past was a thief with the rest, and I just wanted to re-live my life. Having finished the job, I began preparations for breakfast, and waited for night to lift. In the first place, a western mansion standing in a forest with no roads leading to it is strange. The girl that lives there rarely comes to the village. However, lately I’ve seen what looks like her daughter. Why do I say her daughter? U.N. Owen wa Kanojo na no ka? Barely hanging on to consciousness, I, the earliest riser, was already at death’s door. There was something in this morning’s ham and eggs. How stupid of me, to not know anything even though we’ve come down to two. It was all *s fault, when * went mad I should have killed *. But whatever I might do, it’s just too late. I felt that I saw a shrine maiden, was this just an hallucination of mine? Even so, was the color of her hair really that blonde? In exchange for my life, I wished that I could see this hallucination just a little while longer. It seemed that wish was only granted to one before me. You really have no imagination. It was as if you wanted to fall into the trap. If the culprit was one with the imaginative power of U.N. Owen, they’d have your neck on a rope before breakfast. Just what is this? One poisoned by coffee, one nailed to a tree, and another beheaded…. I whispered the last having prepared a chair and a rope. The last one killed had to have been the one poisoned by the coffee. So, just what is the meaning of this? There was something put into my food last night. But what does that matter? Now I’m all alone. This time I tied a strong rope to the ceiling, and kicked a tall chair. This time for sure, my body won’t ever hit the ground again. Tomorrow I have nothing planned. No one comes here, humans or gods. Youkai? Ah, well they come every day. The shrine maiden of paradise spent the summer in an unchanging peace. On one of those summer days, the shrine maiden wrote this in her diary. About all that happened today was that I met a beautiful blonde haired girl walking out from the direction of the ruins of the western style mansion in the forest. I felt like i had seen that girl somewhere before, but I didn’t waste my thoughts on such a trivial thing. In jest, that girl stuck out her tongue and quickly bowed with a great smile on her face and went off in the direction of the exit to paradise. What a strange girl. Now that I think of it. That girl was the only female in that group of honest eight. But what does that matter. Ah… today’s another boring day. In this paradise “Gensoukyou” the number of humans dropped by eight, and seven corpses were safely carried off by youkai. Gensoukyou has lost the honest group for all eternity. Well, it’s just a numerical shift. Lately, the number of people that’ll say thoughtless things such as “that’s magic” or “that’s a youkai’s doing” are increasing. How depressing. I’m sure this is the first time, so nice to meet you, this is ZUN. I’ve been composing for a long time, but just now thoughtlessly have put out a music CD. The contents are really sort of against the times, retro love as it were. It’s especially not the sort of stylish, dance-game type of music, but is a perfect match for the people that love the straight game music from long ago (a small few of you I’m sure). Also, it’s also girly-tastic so for people with that sort of hobby, I’d like you to listen as well. From here on out, I’d like to continue composing eastern and western antique original melodies. By the way, it’s possible that while listening to this CD for some reason you can’t feel at ease. That’s because when people (or other things) depart from the road, they can’t fully safe. Illegitimate Child of the Honest Village, the Most Acrophobic of Them All. Nice to meet you if this indeed is the first time – this is ZUN. This CD is the press version of the one released at C62. The tracks themselves are all ones I made a long time ago, so listening to them now is a bit embarassing. Most of them are arranges of tracks I used in my own shooting games. If you would recognize of the feel of the long gone by arcade era’s game music listening to this, it would make me happy. Also, to those people throwing away Japan and flying off overseas, I would like you to listen too. The C62 CD has Reimu on it, but the other CD has this blond haired girl(/doll?) 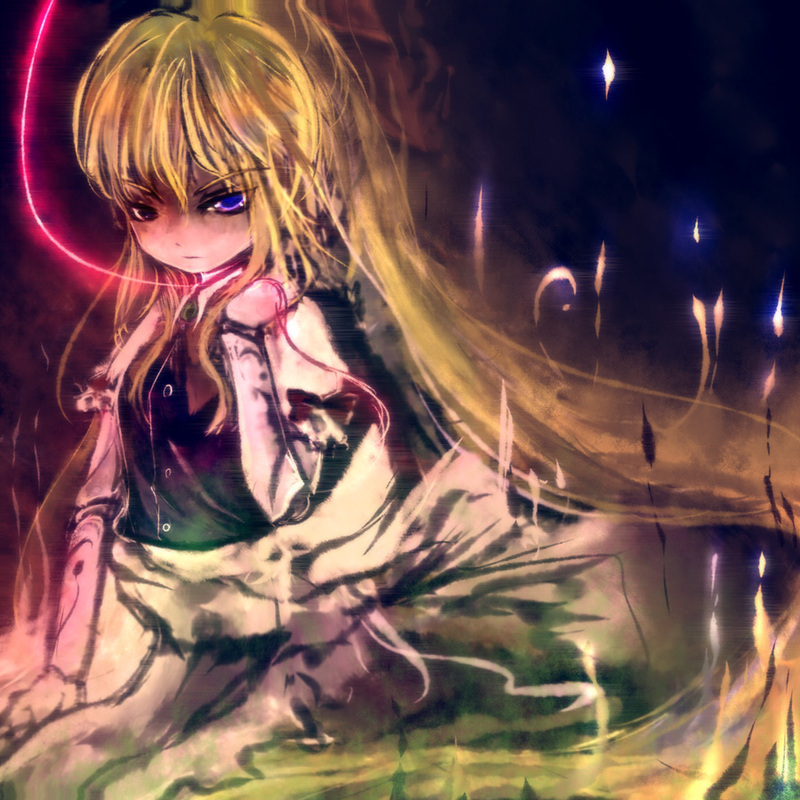 who is not Flandre with a stake and a voodoo doll(/baraningyou). ESoD was released on C62, if the wiki is to be believed, but though many things (besides noted above) point to Flandre (including the “and then there were none”), again, I don’t think Flandre’s the culprit. Therefore, I suspect “the most beautiful of them all” due to the wording of “the capture”, and also relate it to the wording of the narrator in the beginning (quickly after entering, I quit being human). The most cowardly was in love with the most beautiful, and thus was not killed (and was possibly the one who saved him the first time), but she scorned him for his cowardice, and for the idea of all to wander off in the first place, so had no problem of driving him to suicide in the end. However, there’s no real way to be certain. Also from Reimu’s comments about youkai, I believe that the group of eight were NOT killed by youkai, but by one of their group – because humans are less peaceful than youkai. Commentary etc. “when I was young I feared monsters but now I fear humans” sort of thing. Here are a few other possibilities: the wisest one, because that death is the least clear, but I’m certain that the culprit was mentioned before the cowardly’s story (whose love whom I think must be the culprit was already missing); the cowardly one, because he was “asleep” while two of the last three were killed, and it’s possible that the second portion of Reincarnation is a crazed version of himself talking to his cowardly self, and he(/she) is who the earliest riser suspects – but I don’t think so. The “clown” is the most confusing really. I don’t know where to place it, whether it is indeed the culprit, or was really trying to stop the culprit, or just a random youkai wrecking havoc. For I think for the first song it is equally as likely for the clown to have cut off the head of the most curious as a jealous thief (noted in Reincarnation) cutting off the head to try to get the branch for him/herself. ZUN modeled Flandre and this story off of Agatha Christie’s “And Then There Were None”, which you can look up on Wiki for more info (that’s where UN Owen comes from). I imagine this written to be unsolvable or may only be solvable by the author, but it’s fun to try to solve things, even if they are unsolvable. Assuming that the events in this story take place with chronological placing as per real life, then since the trial version of EoSD came out before this CD, then it is likely the spell card rules were already established before the plot of the story. Which makes it illegal(lol) that a youkai would kill humans. what bothers me is that in reimu’s diary entry she said “ruins of the western style mansion in the forest.” Was this the scarlet devil mansion? I don’t think so. More likely to have been Yuuka’s Mansion which may have been ruined after the events of TH04…. More possibilities, the cast of TH04 is also suspect, maybe Elly? ZUN likes to use “abandoned western style mansion in the forest a lot”. It might be useful to look up all the instances haha.. If I had the time I’d love to collect all the info I could and compile it together into a sort of volume. Maybe after I graduate?? >.> As for spell card stuff, I think it’s an interesting explanation for dispute resolution, but Reimu definitely has killed a lot of youkai, and a lot of youkai and other demons etc. have killed lots of humans. (As long as there’s a balance things are fine apparently). I see your world view of Gensokyo is quite like Akyu in Perfect Memento in Strict Sense. Well that’s probably quite a reliable source in some sense but I think that somewhere along the line humans and youkai started to get along somewhat peacefully… and hence not exterminating youkai or killing humans… At least so it says in Perfect Memento In Strict Sense.. The cowardly one was the culprit. She is “the clown” who killed the other honest men. It’s implied that she is literally not a human, and is a humanoid youkai or something else, and survived her hanging (twice) because of that fact. She also appears to have no recollections of her crime, and was “assaulted by sudden sleepiness” around the time the most cautious of the group was killed, meaning that she likely had some kind of alternate, murderous personality. I read somewhere before that it might have been Alice Margatroid, with the basis that she was blonde and was formerly a human who became youkai. Yeah, but the pictures of the two look considerably different, and Alice came out of Makai (she was originally not/more-than human, whereas the “village” supposedly came out of the Human World…) But then again there’s the thing with the bara-ningyou, so it’s a pretty good theory. Makai is only PC-98, though (and ZUN has stated that everything was a “clean sweep” starting from Embodiment of Scarlet Devil), and so in windows, she was indeed originally human. Clarification: I meant the Makai that Shinki made, not the Makai in UFO. Though I myself consider her a separate character. I believe that the most beautiful one is the culprit here, if you look at its line involving the clown it’s possible to read it more as ‘I told a lie about a clown and from then on was no longer honest’ which does allow the number in the honest group to dwindle while keeping her alive and still ‘in’ the group. The bit about someone no longer being human soon after entering has no relevance since through the whole story the narrator changes, for all it matters when it comes to who’s behind the murders it doesn’t effect the actual mystery. Although this theory does have an issue when it comes to the death of the most curious, if we’re to believe that the culprit is behind all 7 deaths aside from a potential suicide of the one who was reborn. It is possible that that death were said as a red herring and instead done by a normal thief coming after the jeweled branch. Either all of that or we can just say “that’s a youkai’s doing.” Like Reimu said though, it’s quite depressing when people believe that. This just really looks like And Then There Were None! 1.) “One day, one of our number found a small hole in the curve of a peach tree. Yes, it was from then on that we stumbled into paradise. This implies that the culprit was aware of some kind of major change from within herself from the very beginning of the story. I should point out that this type of entrance to Gensokyo is classic of Yukari’s antics. She may have even kickstarted the transformation process by manipulating the boundary of human and youkai… but that is pure speculation. 2.) The shrine maiden stated that one of them “doesn’t seem like she is either human or youkai”. This implies that the culprit was not fully a youkai yet, but was instead transitioning. This implies that she has a significant change in character after the first failed hanging. 4.) “In the first place, a western mansion standing in a forest with no roads leading to it is strange. The girl that lives there rarely comes to the village. However, lately I’ve seen what looks like her daughter. Why do I say her daughter? This implies that she has fully changed her physical appearance to resemble a youkai by this time, but was not always like this. 5.). The interlude is implied to be the youkai half speaking. It suggests that the youkai retains her human memories and many of her characteristics. However, it also suggests that her personality is a warped reflection of her human self. She is not cowardly, or timid at all. Also, the youkai appears to share the same sense of identity as the human side. These points taken along with the following points actually suggest that the transition is similar to dissociative identity disorder, although with a somewhat atypical combination of symptoms. The most unusual part is that both the human and youkai share a single sense of identity. However it is hardly surprising that such a comparison can be made about an emerging youkai. This is even further evidence that the culprit’s mental status had not only visibly changed, but that it had changed while in Gensokyo. Ergo, it must be due to the transformation. This implies that the symptoms analyzed are unlikely due to a preexisting condition such as a genuine case of DID. This implies that her humanity is quickly slipping further away as she loses control. This also mimics DID. 8.) “Just what is this? One poisoned by coffee, one nailed to a tree, and another beheaded…. This implies that she only has a vague understanding of what is happening to her and what she’s doing. She can’t come to grips with the reality of the situation, and neither can she fully remember the precise details. But she does indeed remember enough. In particular, she should not know about the one nailed to a tree, yet she does. Nor should she remember the one who’s coffee was poisoned(who’s death was hidden from the group). This also connects the mysterious ‘clown’ with the cowardly one. She remembers events that were associated with the clown’s murders, that she would not have been present for otherwise. How the clown is significant remains a mystery though. 9.) “There was something put into my food last night. This implies that she finally gives away the rest of her humanity at this point to escape this nightmare. All that remains is a youkai. Taken altogether, it really paints an interesting (and disturbing) picture on the subject of transforming into a youkai. The timeframe of the transformation process can be roughly estimated as well. 1.) “I wonder if even now under that cherry tree * is sleeping. This passage implies that one of the group has been buried for at least several years, yet most of the group are still alive. This means that the youkai transformation process starts out rather slowly. 2.) Two references to the shrine maiden(not the one about the blond shrine maiden) are implied to be Reimu. This suggests(but still leaves room for interpretation) that the maximum timeframe of the transformation is not much higher that several years… Reimu is not that old. This means that between passage 2 and the end of the story is roughly several years time. 3.) By passage 4, the youngest of the group was STILL too young to drink. This implies(unless you believe the youngest to have been a single digit age upon arrival to Gensokyo) that the entire story isn’t likely to be longer than several years. At the very most, it puts an upper bound of around a decade from start to finish. This implies that the group has lived in the mansion for long enough to be recognized by the people of the human village, yet not overly familiar with them. However, given the limited amount of time that the remainder of the story has left, it is unlikely that between moving into the mansion and this point took longer than a few months time. The final 4 deaths (poisoned, nailed to a tree, poisoned, and self hung) are implied to take place within a 24-48 hour period of time. This is a stark contrast to the previous 4 deaths that spanned over years. Within that time, the youkai has visibly started to look as such and may explain why she hastened the murders. The order of the deaths as well as the manner of deaths are a useful clue as to the mentality and abilities of the young youkai. They are as follows. Disclaimer! This section may be disturbing. 1. Off with their head. 3. Off with their head. 5. Stabbed in the back. 7. Nailed to a tree. As you can see, the first 3 murders were performed in a generally quick and brutal manner. Afterwards, the cowardly one tries to commit suicide, but it doesn’t work. Next, the murders start getting more creative and generally effective at generating fear. Finally, near the end of the story, the pace of the killings quickens, rapidly finishing off the rest of the group overnight… but in a manner that will generate much more fear and doubt before death. All of this shows that the art of generating the most fear possible is not something that a youkai is born with, but rather is a learned process. The fact that the first three victims were all killed while they were in isolation from the group also indicates that the young youkai is a bit more cautious about it’s meals. Later, the attacks get much more brazen and bold. The final killing spree shows complete confidence in her abilities to hunt. For bonus points, this analysis can be summarized and generalized to show that characteristics of a youkai emerging from a human. I don’t know of any other canon source that allows this level of detail on the subject…. A newborn youkai starts off(over about several years time) looking and acting like the original person except that they have spells of violent and crude behavior conducted against ‘safe’ prey. They are aware that something major is different about them from the earliest stages. Later on(lasting on the order of months) the youkai gradually refines her art and gets more bold in choosing prey. The overall mental status of the non-youkai side starts visibly changing, but still visibly looks like her old self. Later still(lasting a matter of days at most), the youkai starts really getting bold, and more importantly, confident in attacking prey. The youkai changes physical appearance and begins to actually look like a youkai at this time. From here on out, there is not much of the old self left to hold on to and it’s mostly the youkai that is in control. While not a certainty, it seems that the youkai will eventually replace the original self. Throughout the whole process, as long as there is at least a hint of the old self left, that self is at least somewhat aware of what is going on but unable to do anything about it. It’s unclear if the old self is aware while the youkai is in control. Both halves share memories, many characteristics, and identity, but have contrasting personalities. The process mimics dissociative identity disorder. It is possible, and even likely, for some of the original personality traits to be retained even after the transformation is complete; although the majority of the personality will likely be different.